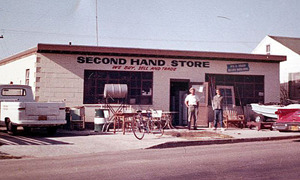 Richard Ross, founded today’s San Clemente “South Coast Furniture & Mattress and Secondhand Store” (Yes, that’s the legal name), in 1957 and it’s been going strong ever since. Although Richard passed away at age 93 on January 16, 2010, his family carries on. What does South Coast Furniture do? Well - that’s hard to describe in a word - but Richard’s son, Dale, who took over the business in 2001, explains, “We sell a wide variety of brand new home and office furniture, mattress sets, custom upholstery, lamps and other accessories ... all at discounted prices. Dale recounts that customers often say, “I wish I had known about you sooner! You need to get the word out.” Usually these people drove to LA and bought something in a big store there when they could have gotten almost the same thing better and cheaper at South Coast Furniture. South Coast Furniture offers same-day delivery and set-up of all in-stock items and there are literally thousands of items to choose from. It might take an entire week to walk through the cavernous and spacious store and even LOOK at each item stocked there. Dale and his family have easy lay-away plans, take special orders, and focus on customer needs. Featuring 12,000 square feet of retail display backed by a 4,000 square foot warehouse makes South Coast Furniture one of the largest retail firms in San Clemente, manned by three full and three part-time employees. It’s an eye-candy adventure to just take a morning or afternoon off and wander at leisure through the place. “We often get called upon to go out and actually furnish a home,” says Dale. “A lot of professional real estate ‘stagers’ and realtors come here for furniture to put in an unoccupied home to make it look more desirable to home buyers. “Also, we have customers who do short term and summer rentals -- we get a lot of that. Several large apartment buildings in town use us so they can rent furnished apartments. They buy the furnishings outright, and then we often buy it back from them at salvage value. Many professional decorators come here because we have so many one-of-a-kind pieces that they can use. South Coast Furniture & Mattress buys and sells most anything. Contact them at| www.SouthCoastFurniture.com | 949-492-5589, or drop by the shop on Calle de Los Molinos.